Want to write for GLG? Liz Stephens needed to get out of Los Angeles so she packed up her husband and her dogs and moved to…Wellsville, UT. She moved ostensibly for grad school but found she learned as much from diving into local history, her Mormon neighbors, the animals she raised and gave away and the ones who died, as she learned in books and classes. 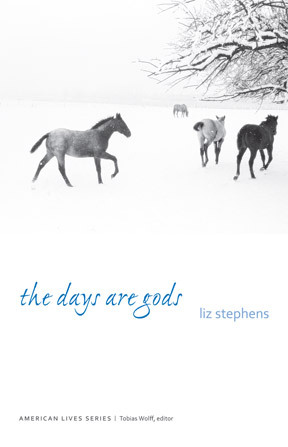 In her lovely, meditative memoir, The Days Are Gods, Stephens tells about white teenagers dressed up as Indians, a French kid who spends his summer on a Dude Ranch, surprise goats, and discovering how going to a non-trivially alien place helped her discover (or become or transition or whatever) into her adult self. Stephens received her PhD in creative nonfiction from Ohio University. Her work has been featured in Brevity, South Dakota Review, Western American Literature, and Fourth Genre. She received the Western Literature Association’s Frederick Manfred Award and was a finalist for the Annie Dillard Creative Nonfiction Award. She’s equally talented at making a cup of earl grey tea and a mean mint julep. She will stop to ogle or coo over any animal in the vicinity, especially dogs. She can parallel park like a boss. SS: Okay, let’s just start out with a big one: At one point you write about the sight of a grey barn on a mountainside: “I’ve seen that movie, the one with the barn in the mountains. I’ve read that book, the one with the treacherous winter. And now I am really there.” Now that you’ve lived in Utah and returned for visits, spent 4+ years in Ohio, and returned to Los Angeles (not to mention written and re-written this book), is there an essentiality to “the West” or is it—always and forever—artifice? Or narrative? Or dream? LS: I think the West is like a celebrity who when interviewed says, “You know, there’s me, and then there’s capital letter Brad Pitt”—or whoever—the distinction of course being that from inside one experience you know a thing, and then culturally there is this mystical entity fed by a whole culture’s desires. Cultural values I wanted to attribute to the West exclusively were demonstrably true of Ohio as well: tractor derbies are good fun, and you should keep your business at the local feed shop or they will close and you will be screwed some day in the future when you need them. Neighbors are, like fences, worth investing time in. Being a college professor living in the country is not the same as being a grounds keeper at the campus and driving in to work, and none of you are going to be able to pretend it is. It’s a wise idea, that you suggest in your own question that the West may be a narrative. It is. If you tell your life in a big epic way, those are the features you feature in your surroundings, no matter who you are or your line of work. If you keep stories small and close to the home, you value that in your narrative of your own life. You describe your region in which that life plays out accordingly. Sometimes the West is simply the line of box stores you are most familiar with, with a really long snowy season. Sometimes loss feels like a stampede of aurochs storming at your back. That’s how it looks, too, in Benh Zeitlein’s lyrical Beasts of the Southern Wild. Having survived a cataclysmic storm and a forced evacuation, the film’s six-year-old protagonist Hushpuppy (Quvenzhané Wallis) is coming home to her Gulf Coast town, the Bathtub. Hushpuppy’s an innocent, but she knows what she’s coming back to: a sick father and a ravaged town. So when she wheels around to face the auroch, she’s not scared. There’s nothing it could do to hurt her. “I’ve gotta take care of mine,” she instructs the animal. Until she’s through, the apocalypse–whether it comes in the form of extinct beasts or the melting ice caps she also envisions–is going to have to wait. That apocalypse is closely linked to Hurricane Katrina and the inequalities its devastating aftermath exposed. The Bathtub takes the brunt of the storm, thanks to a levee that divides the rural town from a city where a remote factory looms. Hushpuppy and her father Wink (Dwight Henry) ride out the battering rain and wind in their patched-together home, then spend the next few days in a boat, pulling neighbors from their rooftops. Official rescuers are nowhere to be seen. When the authorities finally do show up, it’s to force the citizens of the Bathtub into a sterile evacuation center that appears galaxies apart from their lush, shambling hometown. 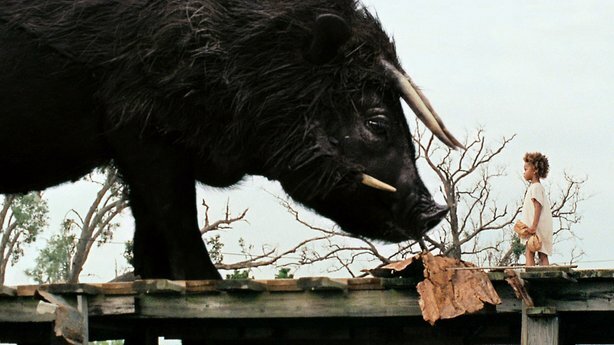 The music and imagery in Beasts of the Southern Wild push Katrina into the realm of myth. A sweeping score plays over scenes of the town’s last festival before the storm, radiant with sparklers. When Wink and his friends decide to bomb the levee to save the Bathtub, they plant the explosives in an alligator’s corpse. An island brothel is transformed into an offering of temporary mothers. They slow dance with Hushpuppy and other young girls while “Until the Real Thing Comes Along” plays on loop. But though the film often looks fantastical, it avoids idealizing the Bathtub. Wink is a volatile caretaker, alternately neglectful, angry, and protective. Many of the other adults in town seem to be alcoholics, with the exception of a soothing medicine woman. These problems are implicitly linked with the characters’ poverty, visible in their tumble-down homes. However, the adults are also resourceful, spirited, and determined to survive by staying together. Beasts encourages the audience to empathize with Hushpuppy and her neighbors, but it doesn’t romanticize them or the hardships they’ve endured–a problem common to well-intentioned representations of Katrina’s survivors. Everybody’s a little piece of a big universe, of course. But some people live as if they’re much bigger, all while trying to make the rest of the world small enough to control or dismiss. Hushpuppy’s destiny is largely influenced by such types: the brute officials who barrel into her home, the distant doctors and snappish workers at the evacuation center, the government that approved a levee that appears designed to protect the privileged at the expense of the poor. That’s why mythologizing Hushpuppy’s story is a political move. Aurochs, ice caps, and magical islands give her narrative the shape of a hero’s journey. She gets the legendary scope and largeness she hungers for–though not, despite the soaring soundtrack and her own resolute optimism, the happy ending she deserves. Like many of you out there, the GLG folks could not wait to see The Hunger Games on the big screen. And this last weekend, we did! Given our serious fandom of The Hunger Games more generally, and Katniss specifically, we thought we would do a little HG response fun. So, this week we asked the GLG folks to pick a particular topic from the film and respond to it. Read on, for thoughts on Katniss as badass heroine, terrifying technology, Hunger Games violence, and much more! And, if you have a topic you want to discuss, post away in the comments or send us a question at girlslikegiants@gmail.com. One of the most striking things about The Hunger Games on the silver screen is the terrifying ways technology comes to life. This is not to say that technology itself is terrifying, but rather its destructive capabilities as wielded by the gamekeepers. The pristine and technologically advanced all-white nerve center of the gamesthe arena where the gamekeepers operate—stands in direct opposition, visually at least, to the technology-starved districts and even the arena, which it controls. In the film, visions of dystopian technology rise from iPad-like screens and are then wielded by the simple movement of a hand. A gamekeeper’s quick whisk of her hand sends panther-like mutants into the arena to attack the last contestants. Another hand flutter makes two more appear out of thin air. While the arena is both produced by and at the mercy of very advanced technology, that technology is virtually invisible from within it, save for the shots of the faces of those lost to the games. And, this faux-natural world is incredibly threatening to those who enter into it. Yet in the course of the film we learn to tell the difference between real nature and constructed nature. The film figures the presumably real natural world as a safe haven, outside technology. For example, Katniss’ life and hunting outside the boundaries of District 12, or Gale finding solace in those same woods while Katniss is in the games, suggest an area outside of the Capitol’s technological grasp. For Gale, nature provides comfort and cover. But inside the arena, the visually similar nature threatens Katniss’s or Peeta’s life via deadly tracker jackers, panthers, and more generally the game itself. Enter your email address to follow GLG and receive notifications of new posts by email.